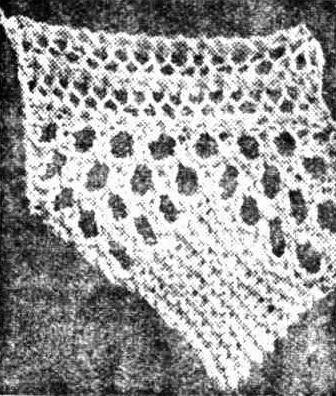 This pattern was originally published in The Melbourne Weekly Times, September 9th 1905. 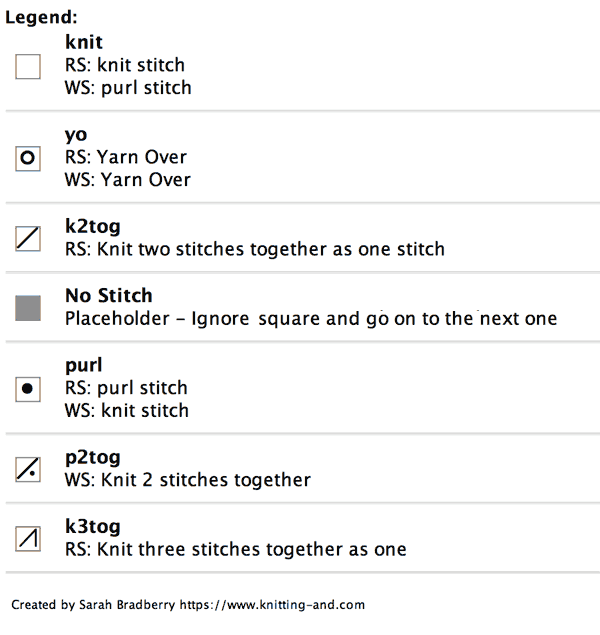 This pattern has been updated into modern knitting language, checked for accuracy using stitch maps and charted. Row 1 (RS): K2, (yo, k2tog, k1) twice, [(yo) twice, k2tog] twice, k11 (25 sts). Row 2: K13, (p1, k2) twice, (yo, k2tog, k1) twice. Row 3: K2, yo, k2tog, k1, yo, k2tog, k18. Row 4: K19, (yo, k2tog, k1) twice. Row 5: K2, (yo, k2tog, k1) twice, [(yo) twice, k2tog] x 3, k11 (28 sts). Row 6: K13, (p1, k2) x 3, (yo, k2tog, k1) twice. Row 7: K2, yo, k2tog, k1, yo, k2tog, k21. Row 8: K22, (yo, k2tog, k1) twice. Row 9: K2, (yo, k2tog, k1) twice, [(yo) twice, k2tog] x 3, (yo) twice, k3tog, k11 (31 sts). Row 10: K13, (p1, k2) x 4, (yo, k2tog, k1) twice. Row 11: K2, yo, k2tog, k1, yo, k2tog, k24. Row 12: K25, (yo, k2tog, k1) twice. Row 13: K2, (yo, k2tog, k1) twice, [(yo) twice, k2tog] x 3, [(yo) twice), k3tog] twice, k11 (34 sts). Row 14: K13, (p1, k2) x 5, (yo, k2tog, k1) twice. Row 15: K2, yo, k2tog, k1, yo, k2tog, k27. Row 16: BO 11 sts, k16, (yo, k2tog, k1) twice. (23 sts). Rows 1 to 16 form the pattern. Repeat for the desired length.